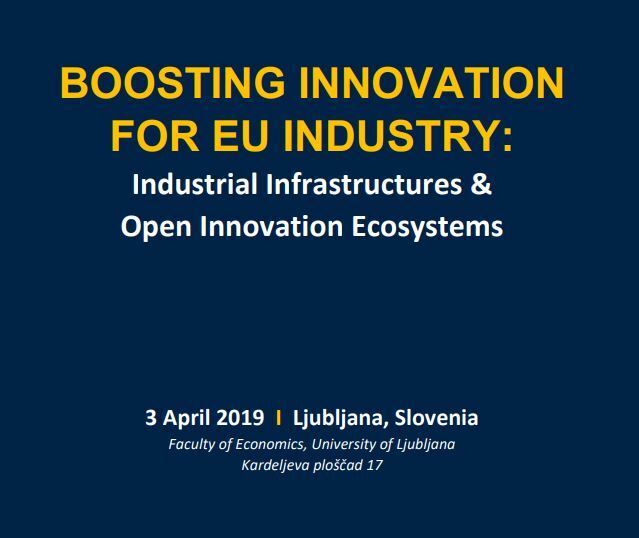 The Slovenian Business & Research Association and the European Commission, DG Research and Innovation are honoured to invite you to the Boosting Innovation for EU Industry conference taking place in Ljubljana, Slovenia on the 3 April 2019! Discussions will focus on future actions targeting a pan-European industrial ecosystem. The main objective of the conference is to present different EU national and regional initiatives to support innovation, access to industrial infrastructure and financial support to boost innovation beyond 2020. The conference will showcase several excellent examples of innovation support with special emphasis on Slovenia and the wider region, provide feedback to high level EU representatives and discuss the needs of the local industry. More so, to provide a great opportunity for networking and matchmaking with companies, research institutes, universities, laboratories, agencies, clusters and other institutions from Slovenia and the wider region. Registration to the conference and the matchmaking session is available here!